In honor of the 1996 Olympics, the world’s biggest hot dog was 1,996 feet long, created by Sara Lee Corp. The average hot dog is consumed in 6.1 bites. NASA has approved hot dogs as a regular item on Apollo moon flights, Skylab missions and space shuttle flights. Did you know there is a “right” and a “wrong” way to enjoy your hot dog? Check out these etiquette tips. Use a spatula or tongs to cook your hot dog on the grill. They can lose moisture and tasty juices when pierced by a fork. From Memorial Day to Labor Day every year, Americans typically consume 7 billion hot dogs. That’s 818 hot dogs consumed every second. Arizona’s claim to hot dog fame is that the World Hot Dog Eating competition was held in Tempe. Around 19 billion hotdogs are eaten annually in the United States. Five hundred and fifty (550) hot dogs are eaten every second of the day in the United States. During the Fourth of July weekend, Americans will consume 175 million hot dogs. Hot dogs are served in 94% of homes in the USA. Children prefer hot dogs (first choice) to hamburgers (second choice) and ice-cream. 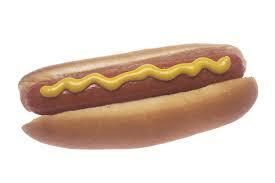 Mustard remains the most popular hot dog topping - 88% of hot dog eaters use mustard. Children prefer ketchup to mustard as their favorite hot dog topping. Hot dog consumption is uniform throughout various income levels. Southerners eat the largest portion of hot dogs. The world’s biggest hot dog was 1,996 feet long, created by Sara Lee Corp. in honor of the 1996 Olympics. A 2,377-foot chicken dog was made in 1985 by Maple Lodge Farms in Norval, Canada. Marlene Dietrich said that her favorite meal was hot dogs & champagne. Babe Ruth once ate 12 hot dogs & 8 bottles of soda between games of a double header. He was reportedly rushed to the hospital after the game with a severe case of indigestion. Al Capone’s favourite food was Nathan’s Coney Island hot dogs, as was Cary Grant’s. On July 4, 1916 four Irish immigrants held a hot dog eating contest to decide which of them was the most patriotic. The winner, James Mullen, at 13 dogs & buns in 12 minutes. President Franklin Roosevelt served King George VI of England hot dogs & beer during a White House visit in 1939. Mrs. Jimmy Carter served hot dogs at a White House picnic in 1977. Queen Elizabeth II served hot dogs at a royal banquet held for the American Bar Association. During the war, soldiers were fed the dreaded K-rations which often consisted of beans, corned beef, or hot dogs. To make the hot dogs seem a little bit more appetizing, the mess staff referred to them as steaks in a tube, or Tube Steaks. 7-Eleven sells close to 100 million fresh-grilled hot dogs every year, more than any other retailer in America.